Another good weekend for the Club as our new members Chris and Karen Ledger and Alex Deck all rode the VTTA National 15 Championships on the V728 up at North Cave, Hull. 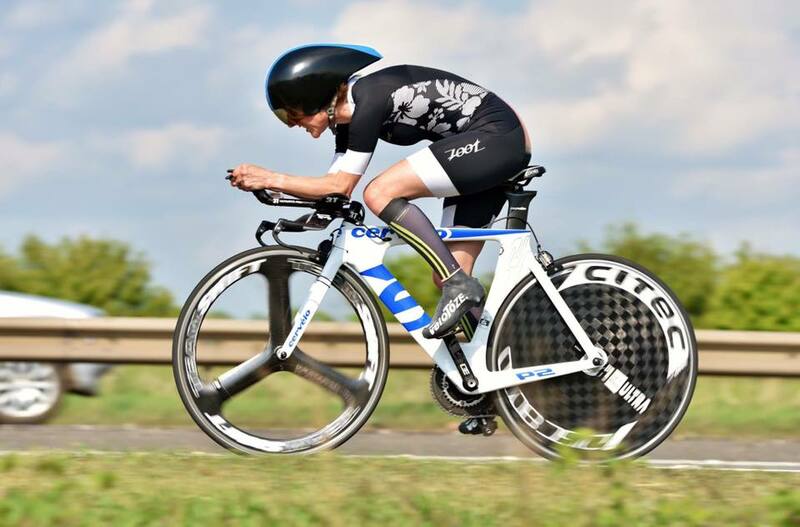 A good performance from Karen securing the win with a 33.42 establishing a new ladies Club record and setting a National Age Record and Chris setting a benchmark for other Club riders to aim for with a 32.03. Alex Deck rode the tandem with Richard Dixon from Team Swift and won the event on actual time with a 31.01 and won it on standard as well with +9.24. The two new ladies that have joined the Club this year have both got off to a flying start breaking the ladies Club 10 mile record in the first couple of months of the season. 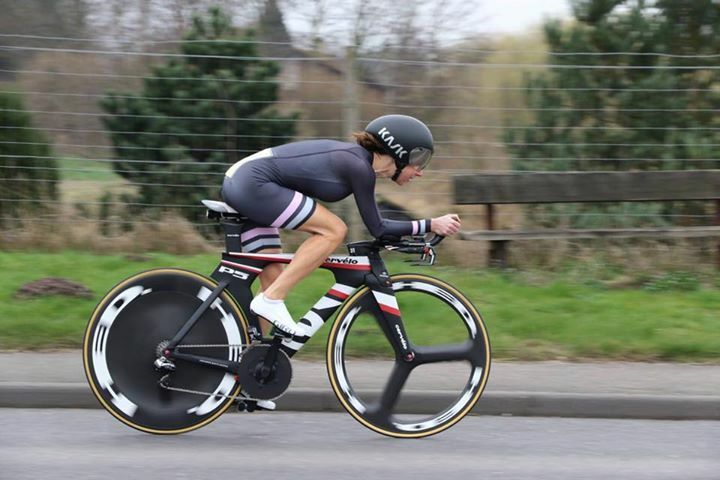 First it was Karen Ledger back in March taking the record down to a 23.28 and this weekend Alex Deck has updated that with a 22.59 in the VTTA Notts and East Mids event. 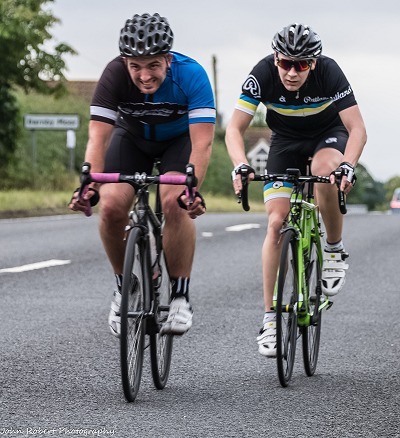 For anyone who doesn’t know, the North Midlands road race league is a local racing run through the summer months on Thursday evening. It is not only excellant training but also an superb entry into road race. The closing date for entries has been extended to Thursday 20th April. We are expanding the programme up to 15 races and riders enter the whole programme like last year on one TLI entry form. Riders will ride in 10 races and marshal 3 times with 2 nights off. Group A will race on Dinnington more than Groups B & C.
DINNINGTON. HQ – Dinnington Rugby Club. TORWORTH/SERLBY. HQ – Harworth Sports Pavilion. So there will be 7 races on Dinnington and 4 each on Torworth & Serlby. ENTRY FEE: £50 plus a £10 deposit for your number. (£40 plus a £10 deposit for U16 category & all Ladies). Points will now be awarded to the first 15 riders in each race: 20, 17, 15, 13, 11 to 1. The first 10 in the Overall Standings in each group. Best in each TLI Age Category in each group (riders must score at least 1 point). 1. If you have not joined the TLI for 2017, you NEED TO DO THIS NOW. 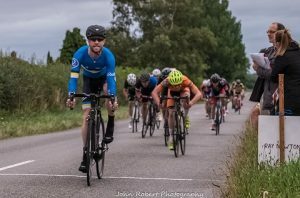 A good day for the Rutland at Saturday’s Bolsover and District 10 on the 010/5 at Cuckney with Chris Ledger being the Club’s fastest rider with a 21.44, Joe Le Sage with a 22.02 and James Bell 22.58. 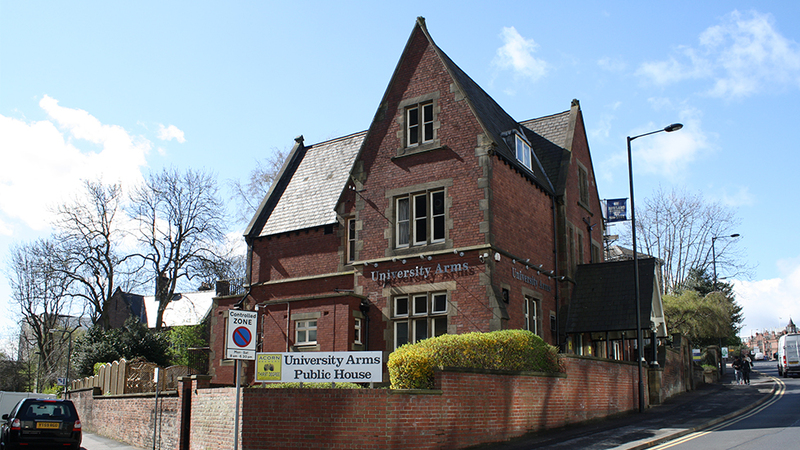 The next club meeting will be held on Friday 3rd March, 8.00pm at The University Arms, Brook Hill, Sheffield S3 7HG. Doreen Oxley, was a long time member along with husband Brian. She sadly died last week on January 30th in St Lukes. Her son has contacted us to let us know that her funeral will be at the South Chapel, Grenoside Crematorium Monday February 13th at 1pm. If you need anymore information, please contact John on 0115 9813086. The Club’s Annual General Meeting will be held on Friday 3rd February, 8.00pm at The University Arms, Brook Hill, Sheffield S3 7HG. Club members will receive an email this weekend with a meeting agenda attached. Bert Ridge – Funeral details. Bert’s funeral will take place on Wednesday 18th January, 11:45 at the Grenoside Crematorium North Chapel and then afterwards at the Cow & Calf at Grenoside where all are welcome. 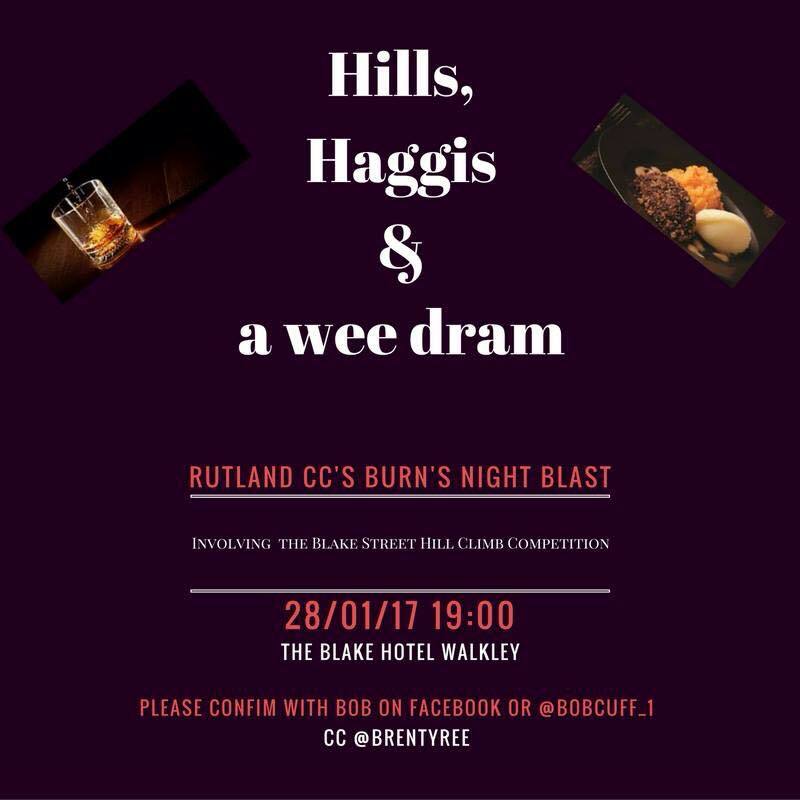 Just a reminder that the ‘Burns’ Night’ social is coming up on Saturday 28th January. @_PiEeyed are doing the catering and are providing haggis pies; mash and neeps (mashed turnip) and there is a vegan option. The Blake Hotel in Walkley for £10 per person will give us a selection of whisky to sample with the meal which, if 20 people come along it works out at £6 a head for food so £16 per person is pretty reasonable. A belated Happy New Year to all Rutlers…. Not the best way to start the year but I received a message last night from Andrew Ridge letting me know that his dad Bert Ridge, long-term Rutland stalwart passed away peacefully in St Luke’s last night (3 Jan.2017) around 6pm with his family around him. 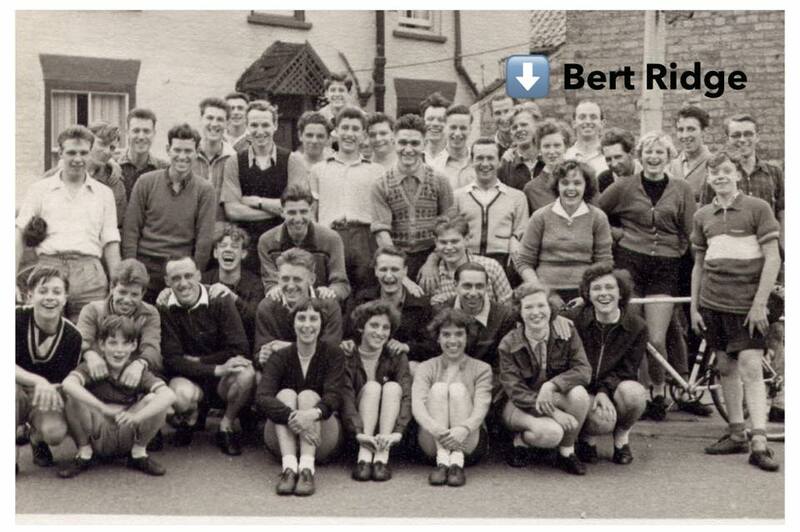 I believe Bert was about 93 but he’s pictured here from a Club run back in the 1950’s.